Jesus entrusted the ministry of reconciliation to the Church. The Sacrament of Penance is God’s gift to us so that any sin committed after Baptism can be forgiven. Through confession we have the opportunity to repent and recover the grace of friendship with God. We humbly place ourselves before God and acknowledge our sins, especially mortal sins. With absolution, we are reconciled to God and to the Church. The Sacrament of Reconciliation is the unique Sacrament of mercy. Children who have reached the age of seven, and who are preparing to receive their first Holy Communion, will be prepared and will receive the Sacrament of Penance prior to reception of Holy Communion. The Sacrament of Reconciliation is available at the Cathedral of St. John the Baptist on Saturdays, from 11:00 am-11:45 am, and from 4:15 pm -5:00 pm. During the Year of Mercy, an additional hour has been added Fridays from 4:00 pm – 5:00 pm. However, changes to the schedule can occur. Please check the Calendar for updates to the schedule. Anyone seeking the Sacrament is always free to make an appointment with a Priest at a different time. Please contact the Church office at 912-233-4709 or click here. 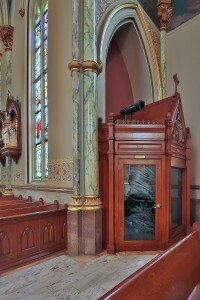 The Confessional is located in the north transept of the Cathedral.